After experimenting with a glaze that was actually meant for chicken wings, I decided to also make candied almonds with it. 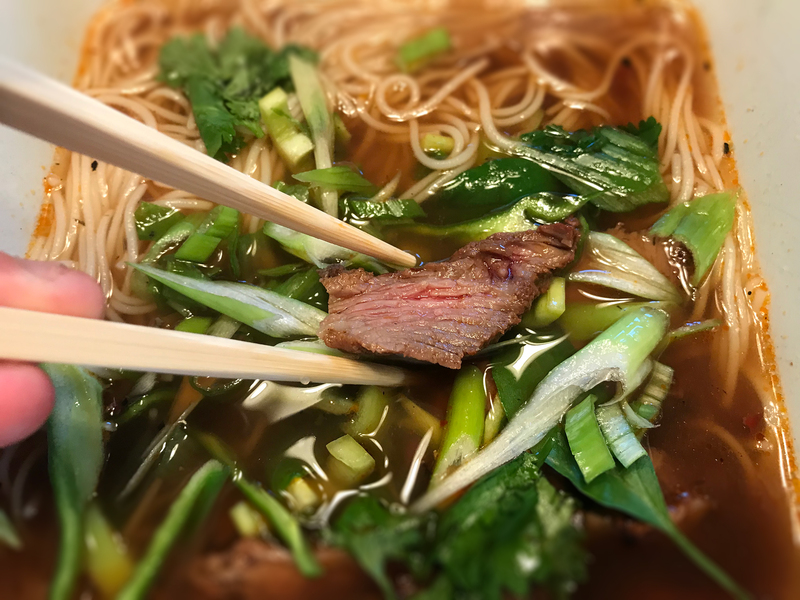 This recipe is Asian inspired; the deep, complex flavor comes from just a bit of Sriracha and soy sauce with sesame oil. Let the glazed almonds set up in the fridge before adding the remaining brown sugar so it will adhere better. Enjoy! I guarantee you’ll be eating more than one handful. Preheat your oven to 300° F. In a medium-sized mixing bowl, melt the butter for 20 seconds in your microwave. 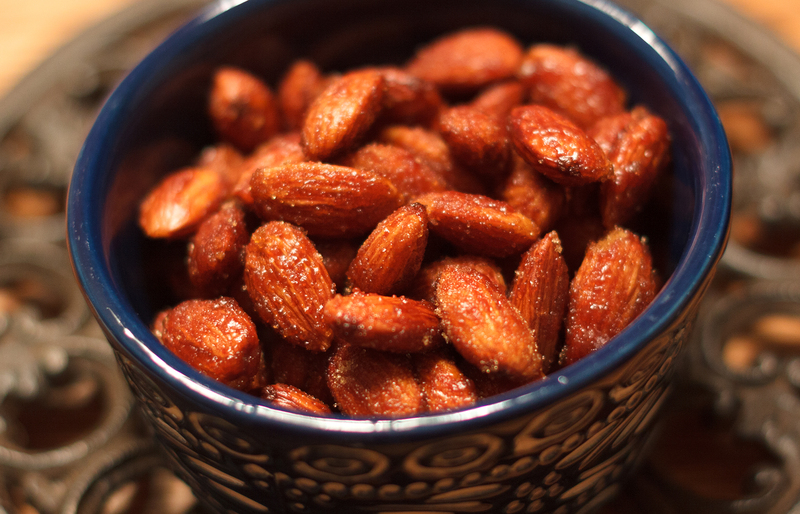 Add the remaining ingredients except for the almonds. Beat with a spatula for two minutes until thoroughly combined. Add the almonds and mix well. Line a large cookie sheet with baker’s parchment paper and fold the edges up to form a lip on all four sides. Spread out the almond glaze mixture on the paper. Bake uncovered for 12-14 minutes. There is no need to turn them. Remove and let cool slightly on your stovetop. Spoon the mixture into a colander and let the excess glaze run off. Transfer to a covered bowl and place in your fridge for 1/2 hour to set up. After a half hour, sprinkle 4 tbs. brown sugar over the top and fold in with a spatula until all of the nuts are evenly coated. NOTE: If you bake the almonds any longer than the time indicated, you risk scorching the butter. Watch them carefully when baking. This is a classic Asian appetizer recipe, traditionally served in Japanese restaurants as an accompaniment to sushi. 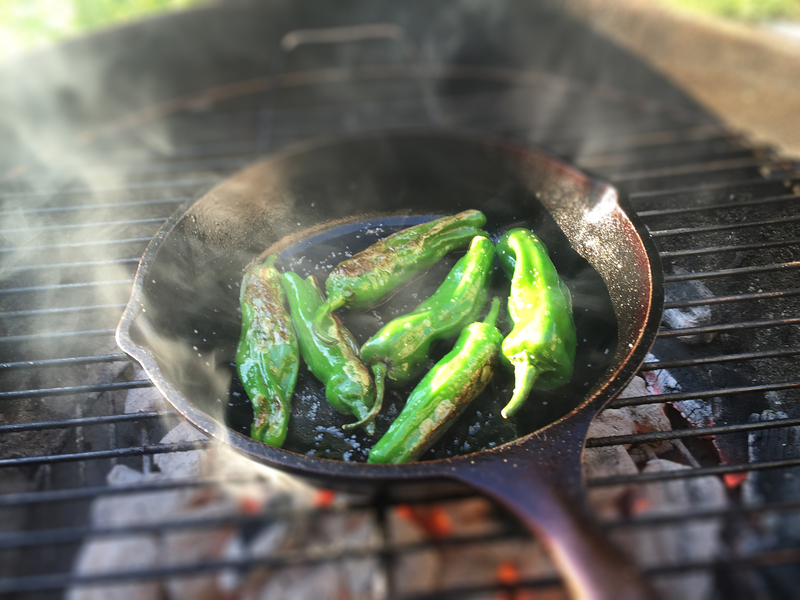 The peppers are impossible to find in local supermarkets here, but I’m told you can get them fresh at Trader Joe’s — my brother had the foresight to plant them in his garden this year and was nice enough to share. 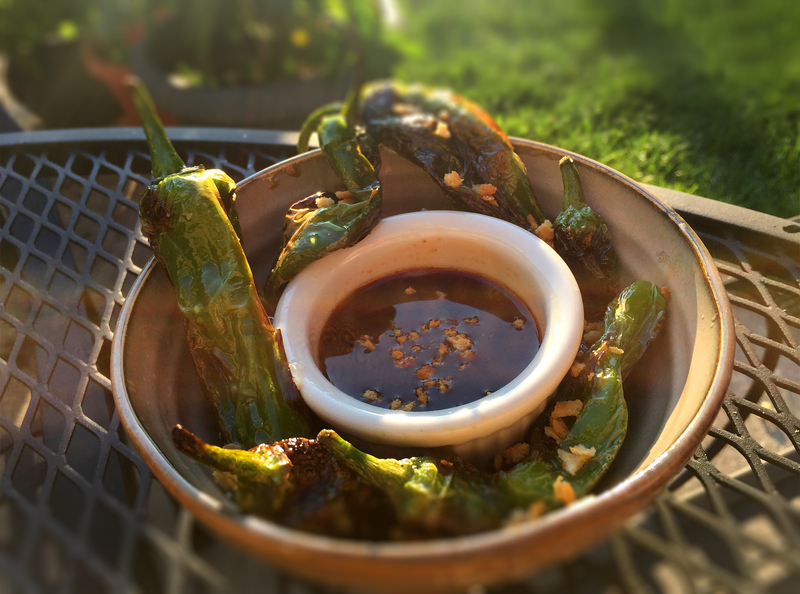 While the chilies are reputedly very mild, the rumor is that one-in-ten are mind-numbingly spicy — so proceed with caution if you’re planning on serving them to hapless guests. The recipe also traditionally calls for the Japanese Yuzu fruit, instead of a lemon or lime. If you can find one, use it. Rinse the peppers under cold water in colander. Pierce each with a toothpick and leave the stems on. Set aside. 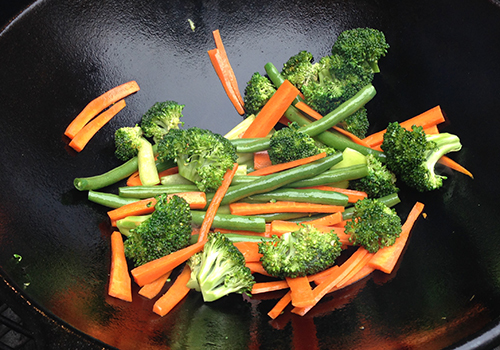 Preheat a cast-iron pan or wok over medium heat on a stovetop or outdoor charcoal grill. Toast the Panko bread crumbs in a small cast-iron skillet over medium heat; about six to eight minutes, shaking often. Remove and transfer to a small serving bowl. Prepare the dipping sauce ingredients and whisk together. Transfer to a small serving bowl. When the skillet or wok is preheated, add the Shishito peppers and toss with about 1 tbs. sesame oil to coat. Spread them out and let them char slightly before turning. Turn and watch them so they don’t scorch. 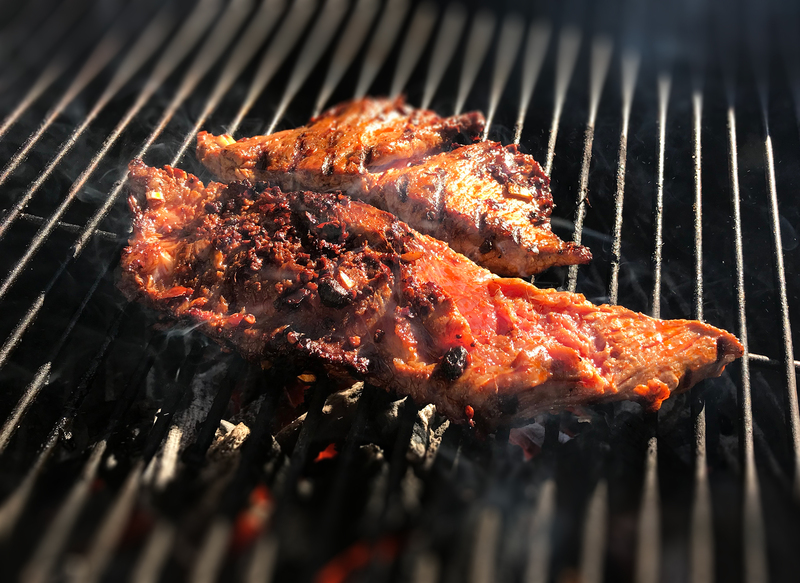 Total cooking time is roughly 10-12 minutes depending on the temperature of your grill or burner. Remove from the heat and add a dash of lime juice and Kosher salt. Stir and then sprinkle with the toasted Panko bread crumbs. Serve with the soy dipping sauce. This is an amazing and economical dish that can be very spicy – control the heat by limiting the amount of hot chili used — but why would you want to? The fish sauce is very traditional, but may be omitted if desired. Get everything measured and cut so you are ready to go, as the preparation only takes a few minutes. In a heavy stock pot, bring 6 cups of water to a boil for the noodles. Prepare 4 ounces of the Lo Mein noodles according to package directions, and cook until al dente; just over four minutes. (One eight-ounce package is enough for two people – the recipe shown here is for a single large serving.) Drain and set aside, covered. While the noodles are cooking, prepare the sauce ingredients by mixing the brown sugar, soy sauce, fish sauce and chili garlic sauce or Sriracha. Set aside. 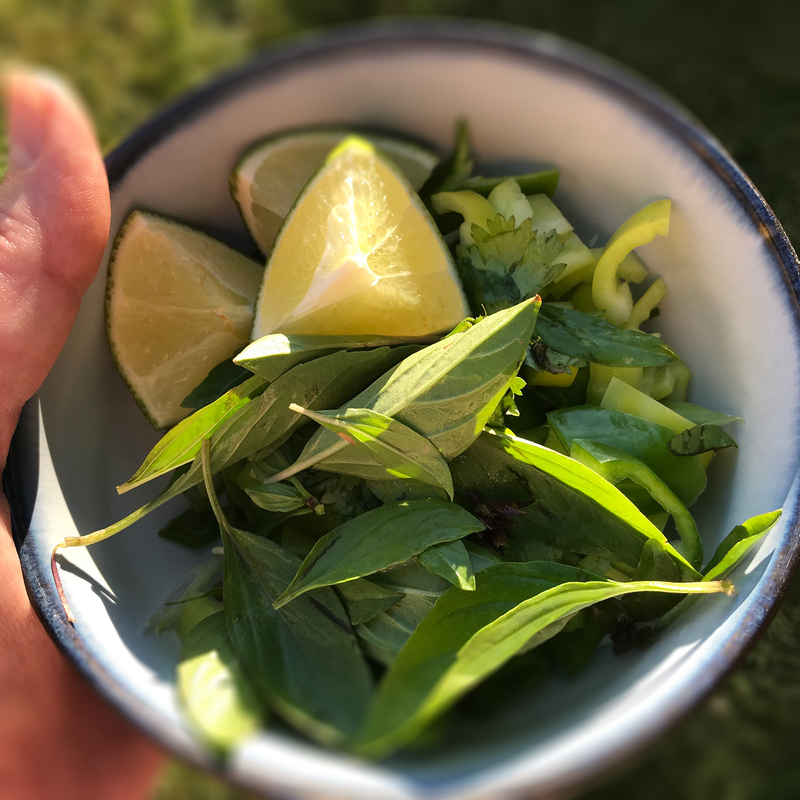 A note on the fish sauce: A little bit goes a long way! The flavor is very intense, so use it sparingly. Heat the butter over medium heat in a heavy wok or skillet and add the garlic; stirring constantly for 3 minutes. Add the eggs and stir constantly until cooked through. Shut off the heat and add the sauce, sliced green chili, noodles, scallion and cilantro. Toss until coated. Serve with lime wedge as a garnish. This Asian recipe can be quite hot – adjust the chilies according to your preference. 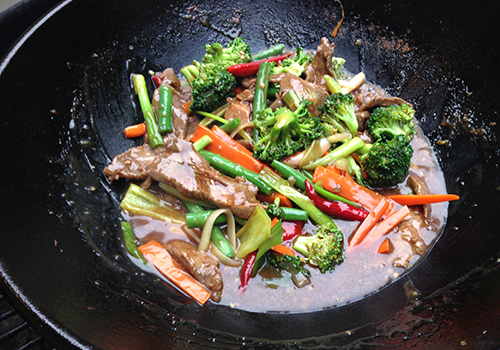 Your wok must reach a temperature hot enough to quickly sear the steak and flash-fry the vegetables. I’ve found that cooking indoors on a stove just doesn’t accomplish this task. A charcoal grill and a cast-iron wok are perfect. I use prime cuts of New York strip steak to ensure optimum flavor and tenderness. Enjoy – this recipe is killer. Using a very sharp knife, trim the steak of excess fat. Cut into 1/4″ strips against the grain. Cut in half if the length of each strip is too long. Whisk the brown sugar and soy sauce in a small mixing bowl. Place steak in a 1-qt. ziplock bag with the soy sauce mixture, garlic and hot Thai chilies. Seal and let stand for 3 hours in your refrigerator. Rotate occasionally. Wash, prep and cut all of your veggies so you have them ready. Allow all ingredients to stand at room temperature before cooking. Prepare an outdoor charcoal gril with enough coal for a medium-hot fire. When the coals are white hot, place the wok on the grill grate. 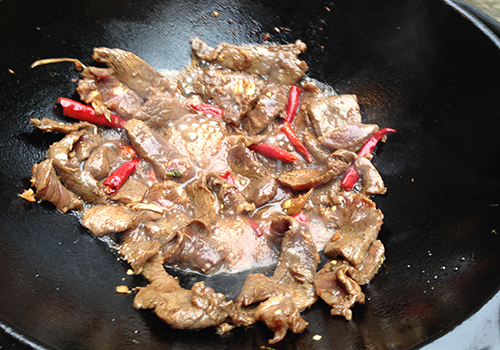 Do not spread out the coals – you will need the heat concentrated directly under the wok so the steak sears properly. 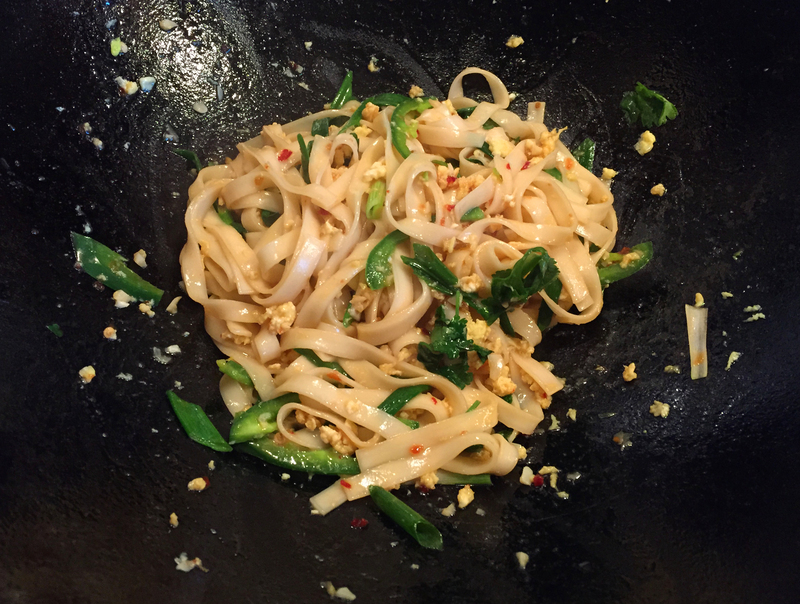 Allow the wok to heat until a drop of water vaporizes immediately on contact. Add 2 tbs. peanut oil to the wok and swirl to coat. When the oil starts to ripple, add the green beans, carrot and pepper and stir for about 5 minutes until just crisp-tender. Remove from heat and place in a covered serving bowl. Remove the steak and chilies from the ziplock bag and add to the wok. Discard the soy sauce. Spread out and let sear for three minutes. Turn with a non-stick spatula and let sit another three minutes. Remove from heat and place in the covered serving dish. Add the beef broth and corn starch mixture to the wok. Stir constantly until thickened -about two minutes. Add the scallion. Stir. Add back the steak and other vegetables and stir until just heated through. Remove from the wok and serve immediately over rice. Adding the steak and chili peppers. A versatile, basic sauce for Thai spring rolls, egg rolls or crab rangoon. In a small saucepan bring the vinegar to a boil. Stir in the sugar and simmer for 5 minutes. 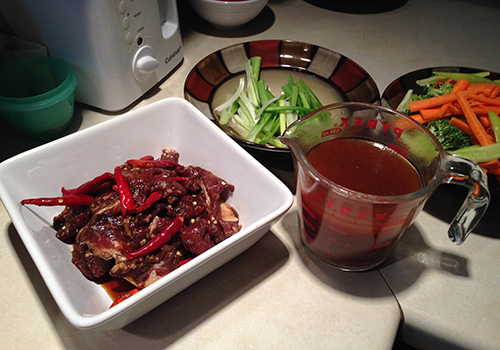 Remove from heat and stir garlic paste and red pepper flakes into vinegar. Cool. 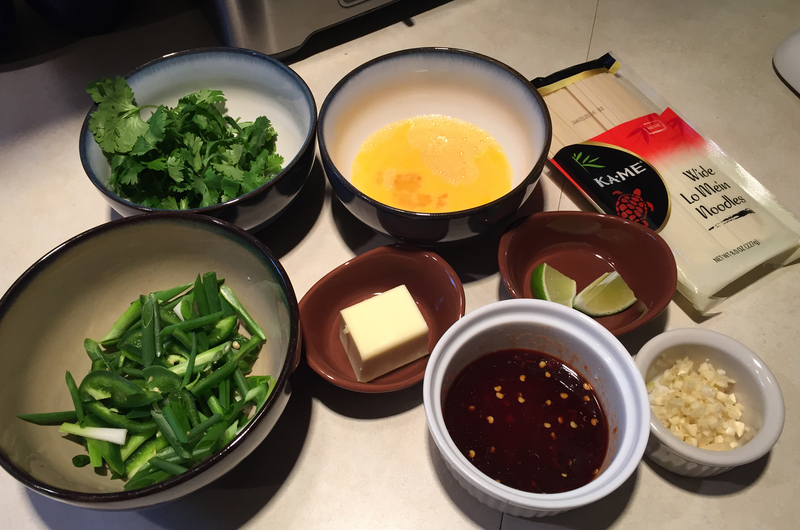 Serve sauce at room temperature in individual condiment bowls for dipping with scallion. Here’s one for dedicated Thai foodies; this recipe is quite hot and a traditional favorite. I really dig making this on the outdoor charcoal grill with my 14-pound cast-iron Lodge wok. The results are fantastic, it doesn’t heat up the house and cleanup is a snap. Toss the chicken with the salt, turmeric, garam masala and cinnamon. Cut off and discard the chili stems, shake out the seeds. Place the dried chilies into a cup of boiling water and refresh for 10 minutes. Drain and puree with the fresh chilies, the scallion, garlic and lemon grass in a food processor. Reserve. Heat the peanut oil in a large wok over high heat. Brown the chicken breast pieces and set aside. Add the chili mixture to the wok, and cook for 4 minutes until fragrant and lightly browned. Add the chicken back to the wok and cook, tossing, until cooked thoroughly. Stir in the chili paste and vinegar, the salt, coconut milk and the lime juice. Cook for several minutes after the mixture boils, to heat through, then add the vegetables and mint. Toss and serve with steamed white rice.